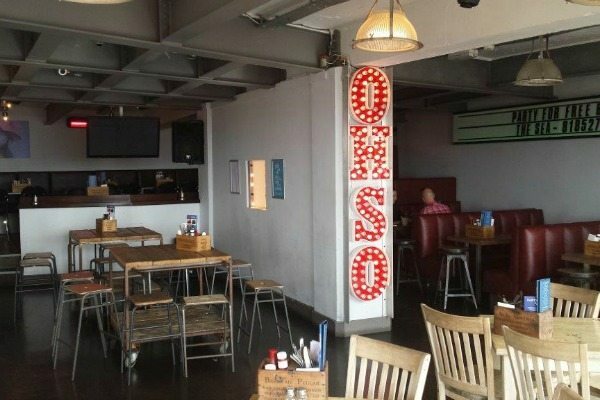 Ohso Social is a large seafront bar/nightclub, which has a family feel and serves classic pub grub by day, then transforms into a lively night spot after sundown, with DJ’s providing revellers with an Ibiza vibe at the weekends. 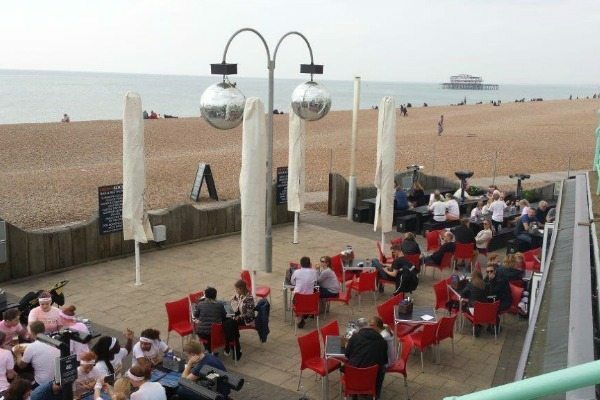 You will find it next to the doughnut groyne, in front of the Queens Hotel, between the two iconic Brighton piers. It is right on the beach and has fantastic, wide-angle sea views. There is a spacious, heated, outside terrace, sporting the largest pair of disco balls you have ever seen (oo-er)! Inside is a good-sized bar and plenty more seating if you don’t fancy braving the elements. The venue can be hired out for exclusive use, for weddings and parties, for no fee as long as a minimum bar spend is reached. 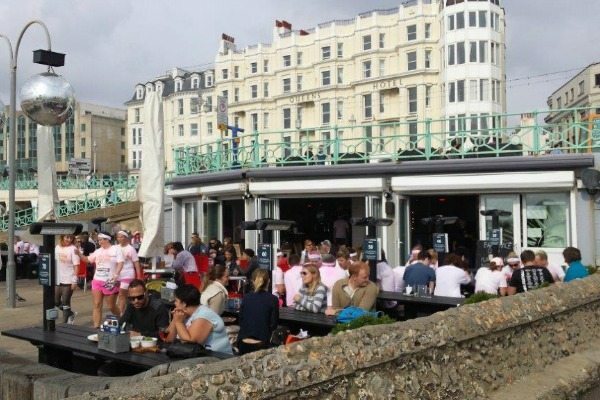 We were extremely lucky, the day we went, to be treated to a rare blast of warm, autumn sunshine and there was a carnival atmosphere on the seafront as Brighton was hosting the annual 5k Colour Run. Everywhere you looked there were charitable, daftly-dressed folk, sporting headbands and covered in multi-coloured powder, brilliant! We arrived just before the rush and managed to get our order in early enough that we were served quite quickly but, be warned, orders are placed at the bar and the kitchen is quite small relative to the size of the venue. There aren’t a huge number of kitchen staff either so they work incredibly hard to get your food to you as quickly as possible. In other words, be prepared to queue and to wait for your order if you go at peak times. Fortunately, if you do have to wait, you couldn’t wish for better views, so my advice would be to sit back and relax with a pint. There is a huge menu so there should be something for everyone. You’ll find everything from hot breakfasts, light bites and sandwiches, to sharing platters, burgers and hearty mains. There are several veggie options and there’s a separate menu for the little ones. You can also treat yourself to one of their delicious sounding desserts or cakes. Canapés or a full buffet can be pre-ordered for special occasions and they’ve got the full range of drinks covered whether you’re a craft beer aficionado or a cocktail-quaffing party animal. We found the staff to be smiley and friendly and happy to help. We were there for lunch and had a busy day ahead so sadly cocktails were out. Instead we settled for orange juice and lemonade to quench our thirst and set to looking through the menu. For starters Andrew decided to go for the barbecue ribs and I went for the deep-fried whitebait. 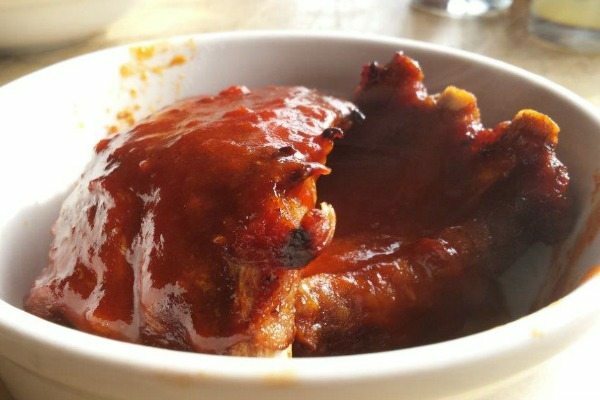 Andrew got five barbecue ribs, which arrived steaming hot and were meaty and thickly coated in a sweet, tangy barbecue sauce. 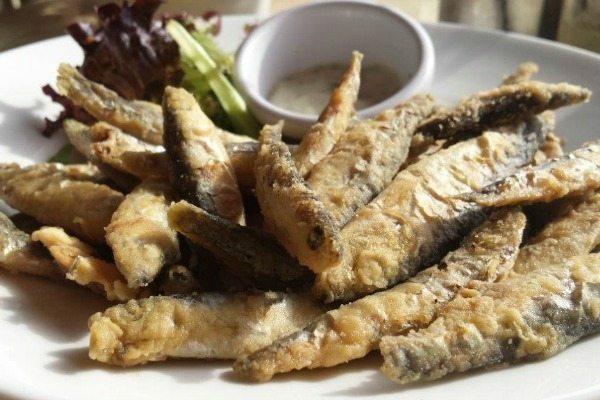 I was delivered a huge portion of deep-fried whitebait, it could have passed for a main in some venues I’m sure. The little oily fish were coated in a soft, light batter and came with a sweet, creamy, tartare sauce and a little handful of mixed salad leaves. In the end Andrew had to help me polish them off as I was in danger of leaving no room for the next course. 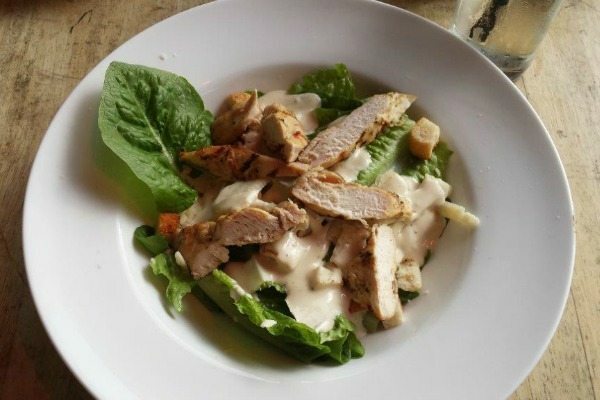 For my main I ordered the Caesar salad, which consisted of fresh, crunchy, baby gem lettuce leaves, grilled white bread croutons, thick slices of parmesan and a generous amount of warm, sliced, char-grilled chicken, all topped off with a healthy dollop of Caesar dressing. Deceptively sinful but you can tell yourself you’ve been good because you’ve had a “salad” 😉 . Andrew went for fish and chips, the old seaside classic. Again it was a very generous portion, I imagine it would satisfy most hungry blokes. 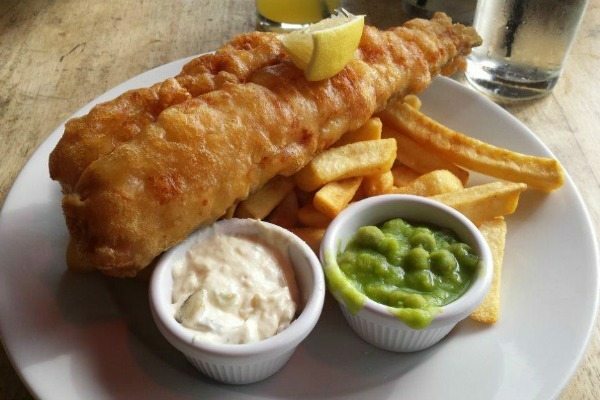 A great hunk of flaky white fish in a thick, crispy, golden batter, on a hefty heap of chunky chips. It came with little pots of sweet, mushy peas and rich, creamy tartare sauce and a wedge of lemon. Needless to say we were both very full when we left and barely ate another morsel all day!